March 18, 1916 – The Cooperative League of America is formally organized, the precursor organization to NCBA CLUSA. March 1918 – League President James P. Warbasse writes an article called “The Theory of Cooperation” for the NAACP at the request of W. E. B. Du Bois, who was promoting cooperative development within the African American community as a means of economic growth. September 25-27, 1918 – The first National Congress of the League is held in Springfield, Illinois with 185 delegates from 386 cooperatives who decide the League will become the national federation of consumers’ co-ops. November 1919 – Cooperative conventions are held across the U.S. to endorse and formalize the League as the central federation of consumers’ co-ops in the nation. 1921 – The League forms a legal department and successfully lobbies for the passage of a cooperative federation statute in New York, then incorporates as the Cooperative League of the United States of America (CLUSA). 1922 – CLUSA purchases and moves into its own building at 176 West 12th Street, New York City. 1923 – The first International Day of Cooperatives is observed. The International Cooperative Alliance sets aside the first Saturday in June to commemorate and celebrate cooperative principles and the co-op movement worldwide. 1935 – The Rural Electrification Administration is established through executive order by President Roosevelt to electrify rural America. At the time, 9 out of 10 rural homes are without electric service. By 1953, electric co-ops have brought electricity and new opportunities to 90 percent of U.S. farms. 1938 – Several farm purchasing cooperatives joined CLUSA over the preceding years including the insurance cooperative now known as Nationwide, changing the membership base and philosophical approach to consumer cooperative education to be more inclusive of marketing cooperatives. 1944 – CLUSA joins with other cooperative leaders to launch a public education campaign to defend the tax treatment of cooperatives in Congress. 1944 – The Cooperative Development Foundation is formed, initially as the Freedom Fund of CLUSA, to help provide war relief through the development of cooperatives and other self-help initiatives in Europe. The first grant ($30,000) helps to launch Cooperative of American Remittances to Europe (CARE). 1946 – CLUSA sponsors the creation of the North American Student Cooperative League, which later became the North American Students of Cooperation (NASCO). 1949 – CLUSA works to secure FHA insurance of housing co-op mortgages, Section 213, and organizes the National Association of Housing Cooperatives (NAHC). 1950 – The National Rural Electric Cooperative Association (NRECA) becomes a CLUSA member. 1953 – The international arm of CLUSA is launched in response to a request from the Indian Cooperative Union. Through its first overseas office in New Delhi, CLUSA helped develop and strengthen dairy, fertilizer, farm machinery and other co-ops in the country. 1956 – Sponsored by CLUSA, the Consumer Cooperative Management Association (CCMA), begins a training program for co-op managers. Today, the annual CCMA Conference is the premier educational event for food co-ops. 1961 – U.S. Secretary of Agriculture Orville Freeman convenes the USDA Cooperative Advisory Committee, on which CLUSA Executive Secretary Jerry Voorhis serves. 1963 – CLUSA leads in the creation of the International Cooperative Training Center (ICTC) at the University of Wisconsin, using funding from US AID, for the purpose of training cooperators from overseas. ICTC continued until 1970 when AID funding shifted to in-country mission offices. 1964 – The federal government proclaims October “Co-op Month” after the USDA organizes a three-week event enlisting the support of most of its agencies. Both presidents Kennedy and Johnson were supportive of the observance month, but questions surround which president actually signed the proclamation. 1967 – Working in southeastern U.S., CLUSA takes on a pilot project as part of the War on Poverty that leads to the formation of the Federation of Southern Cooperatives. 1974 – The Cooperative Hall of Fame is established. Inductees receive the cooperative community’s highest honor. 1977 – CLUSA begins working in Indonesia. NCBA CLUSA’s support of agricultural co-ops in Southeast Asia continues today. Working with smallholder farmers, these co-ops are among the region’s leading processors and exporters of spices from McCormick and coffee to Starbucks, Green Mountain Coffee and other major retailers. 1978 – The National Consumer Cooperative Bank is formed through Act of Congress. Its name is later changed to National Cooperative Bank (NCB). 1978 – CLUSA launches the Egypt Small and Micro Enterprise Credit Project in Egypt. The 16-year project lent more than $810 million to low-income clients and their businesses with a 99+ percent repayment rate. 1984 – Sponsored by CLUSA, Cooperative Business International (CBI) is formed to facilitate business opportunities for and among co-ops worldwide. 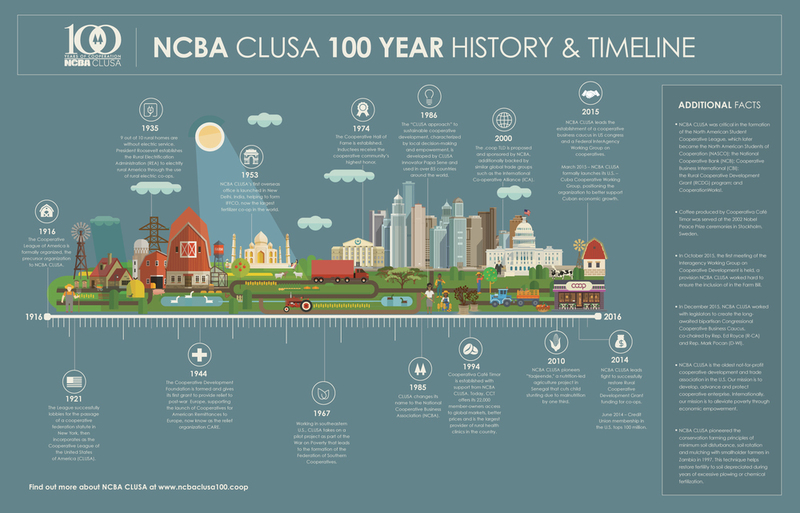 1985 – CLUSA changes its name to the National Cooperative Business Association (NCBA). 1986 – Early adopters of the “CLUSA approach” to sustainable cooperative development in Niger in the mid-1980s. The method is characterized by local decision-making and empowerment, and was developed by NCBA CLUSA veteran innovator Papa Sene. 1989 – NCBA developed the first community-based natural resources management program that blended cooperative principles with the active participation of local people. 1989 – NCBA convenes the National Rural Cooperative Development Task Force to bring cooperative development into federal rural development policy. 1990 – The Rural Cooperative Development Grant (RCDG) program is created, which remains a key advocacy priority for NCBA CLUSA. 1994 – Cooperativa Café Timor is established with support from NCBA CLUSA. Today, CCT offers its 22,000 member-owners access to global markets—including Starbucks—better prices and healthcare through its network of health clinics. 1995 – The Civil Society Strengthening and Rural Group Business Project in Guinea begins—the first project to which NCBA CLUSA applies its methodology to democracy and governance. 1996 – The United Nations adopts a resolution urging that due consideration be given to co-ops in achieving social and economic development goals worldwide. 1997 – NCBA CLUSA begins practicing the conservation farming principles of minimum soil disturbance, soil rotation and mulching with smallholder farmers in Zambia. This technique helps restore fertility to soil depreciated during years of excessive plowing or chemical fertilization. 1999 – Initiated by NCBA and CDF, CooperationWorks! is organized and evolves into the trade association for cooperative developers. 2000 – The .coop Top Level Domain was proposed and sponsored by the National Cooperative Business Association (NCBA CLUSA). Many cooperatives and similar trade groups around the world, including the International Co-operative Alliance (ICA), backed the proposal. The technical infrastructure for the .coop TLD was developed by the worker cooperative Poptel in the United Kingdom and became operational on January 30, 2002. 2002 – Coffee produced by Cooperativa Café Timor is served at the Nobel Peace Prize ceremonies in Stockholm. From 2000 to 2012, coffee growers receive almost $40 million in cash from the sale of coffee and the average household farm income from coffee sales increases by 61 percent. With profits from coffee sales, CCT opens a network of health clinics. 2004 – The U.S. Federation of Worker Cooperatives forms in Minneapolis. NCBA supports the federation by becoming an associate member. 2010 – NCBA CLUSA’s flagship Feed the Future project Yaajeende is launched in Senegal, based on a comprehensive approach built on the four pillars of food security—availability, access, utilization and governance. 2011 – NCBA CLUSA’s USAID-funded Yes Youth Can! project begins, helping at-risk young people create economic opportunities, contribute to their communities and become responsible members of society. 2012 –The United Nation’s International Year of Cooperatives generates momentum on issues related to cooperative enterprises worldwide. The first Cooperative Summit is held in Quebec City, Canada. 2013 – ICA launches a new visual identity for co-ops and a rebranding campaign. A global cooperative marque is launched to differentiate co-ops from other forms of business. 2014 – Credit union membership in the U.S. tops 100 million in June. 2015 – NCBA CLUSA formally launches its U.S. – Cuba Cooperative Working Group in March, positioning the organization to better support Cuban economic progress. 2015 – NCBA CLUSA receives its first grant from the Starbucks Foundation in April to support the livelihoods of coffee farmers in Indonesia. 2015 – the first meeting of the Interagency Working Group on Cooperative Development is held in October, a provision NCBA CLUSA worked hard to ensure the inclusion of in the Farm Bill. 2015 – NCBA CLUSA works with legislators to create the long-awaited bipartisan Congressional Cooperative Business Caucusin December, co-chaired by Rep Ed Royce (R-CA) and Rep. Mark Pocan (D-WI).